Amidst the applause of two thousand people, acclaimed journalist, foreign correspondent, and Middle East expert Robin Wright strode onto the stage Boston’s Symphony Hall. 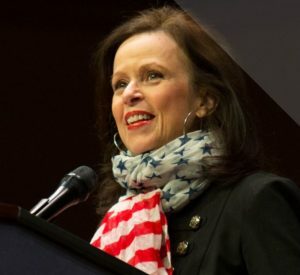 Contrary to her small stature and her own assertion that she was a timid child, Wright has all the confidence of a bull moose, a trait certainly brought on by the more than 40 years she has spent as a journalist covering every war, power change, and terrorist attack in the Middle East. Wright, a contributor to such publications as The New Yorker, LA Times, TIME Magazine, and many more stood in the spotlight January 31, as part of the Lesley University Speakers Series, to discuss her views and observations on the area we call the Middle East. Despite the vast destruction the area has witnessed over much of its history, Wright does have hope for the Middle East. In her words, “terror does end.” Wright gives the statistic that although ISIS has yet to be eradicated, the power they held only lasted 3 years, 3 months, and 3 weeks. With the screen that served as Wright’s background filled with a map of the Middle East, she transitioned the talk to the whole of the region as it pertains to terrorism and strife. She pointed to each and every country, describing her experiences covering wars, dictators, protests, etc. With the overarching theme of beating terrorism, Wright discussed the ways a country can push back against the circumstances that bring them to a state of war. In countries such as Iran, she said, the majority of young people are more aware of the world than they have ever been before. Wright points out that most are, educated, literate, and connected to the wider world via the internet. This gives rise to the opportunity for organized protests and revolutions. However, Wright warns that revolutions often create the very circumstances that challenge their own survival. Once a revolution has taken place the dissidents must deal with the very issues they were protesting such as unemployment, discrimination, etc. As a result Wright presented the statistic that 18% of terrorists end up negotiating with the current government. The situation in Syria, a country described by Wright as the melting pot of religions, has had major ramifications throughout the Middle East. With refugees pouring into the surrounding countries, populations in those countries have exploded. Wright gave the example of Lebanon whose native population is 4 million people, and recently received 1.2 million refugees. While the Middle East has rarely to never been a stable part of the world, the crisis in Syria has the potential to disrupt the whole region especially if Wright’s opinion that “there is no military solution” for any of the wars is considered. I had the good fortune to be in the audience because my brother won tickets to the event and asked if I wanted to come along. I am very glad I did because the talk was absolutely fascinating. Robin Wright definitely inspired me to look into the Middle East, as well as the journalism profession, a whole lot more! Robin Wright is a swashbuckler for sure. Glad to know her voice has not been quieted and she is being introduced to the generation that will actually change the face of politics and ultimately -this planet.